AC2000 Zone Monitor allows a real time view of all cardholder movements in defined zones and is an ideal application in high risk sites where evacuation may be necessary. Zone Monitor provides up to date information on who is present on site for safety and security reasons and offers a real time display / numerical counter of every individual in a pre-defined zone within the building or site. AC2000 Zone Monitor is used in conjunction with AC2000 Muster Zones application. Any number of readers can be assigned to a specific zone to represent a particular area in a building, for example a meeting room. A zone can also be created to represent a security level, for example a maximum security area. 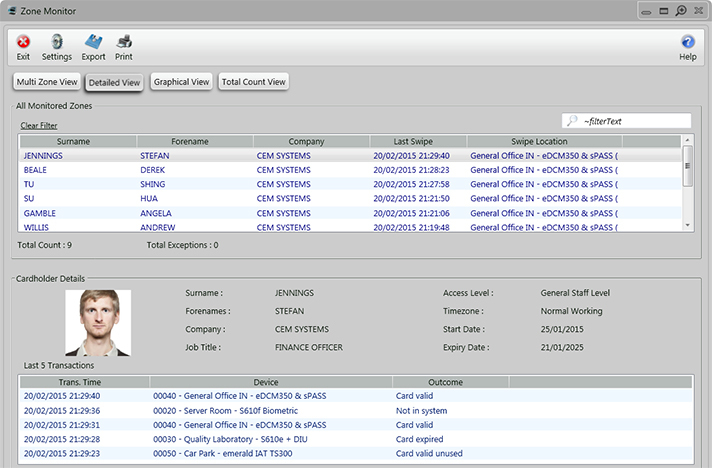 AC2000 Zone Monitor then allows an administrator to view card holders that are present in any zone in real time.